How is it even possible to do white-glove cleaning on your rifle without the best AR 15 cleaning kit? Unfortunately, it would be a tricky and daunting task to find the best gears with the overflowing options you have. The first step to purchasing the right cleaning rifle kit is to know which one suits your requirements. Otis AR Cleaning System. This modern cleaning system for sporting rifles and ARs is the most affordable in our list. Some retailers may have varied price tags for this kit, depending on the promos and markdowns they offer. With its reasonably lower price, the cleaning kit is never inferior when it comes to features in a comprehensive ensemble of rifle cleaning tools. It is no doubt a great value for your money. Pro Shot Cleaning Rod Kit. The mid-range price of this cleaning rod kit makes it a good pick for those that want a competitive price for a full-packed cleaning system. 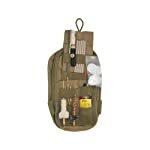 This coyote tan kit offers a smorgasbord of cleaning tools. It is designed for 5.56mm and .223 Cal AR platform rifles. You get a good deal with this kit that includes a substantial number of brass accessories, brushes, mop, and patches. Real Avid Pro Pack Maintenance Kit. On top of the price scale is this premium maintenance pack from Real Avid. 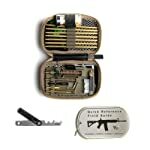 The high end cleaning kit is ideal to use for 5.56 and .223 AR rifles. It is a compact, all-in-one kit that you can conveniently bring with you for a quick field rifle cleaning. Although you need to shell out extra cash for this tool set, it is worth the value given its comprehensive contents fro scrapers to chamber cleaning pads to stuck round extractors. Real Avid Pro Pack Maintenance Kit. This premium quality maintenance kit offers a wide array of cleaning tools and resources for your AR 15 rifle. Inside the ballistic nylon case is a plethora of must-haves for an effective rifle maintenance system. The MSR scraper is an innovative tool that improves your cleaning speed while the field guide gives you a complete walkthrough. Other items in the kit include the pin punch, safety flag, bore illuminator, star chamber cleaning pads, stuck round extra, brass fittings, and brass cleaning rod. Otis AR Cleaning System. Even with an affordable price tag, this cleaning system is unprecedented in its category. The lightweight and compact case opens to a slew of cleaning tools. It includes one 8” and one 30” memory-flex cleaning rod for easy cleaning access. The specialized precision cleaning tool is designed to disassemble and reassemble your rifle for maintenance. Other items in the kit are the bronze bore brush, a bottle of ultra-bore Otis 085 cleaner, mongoose G2 brush, and the B.O.N Beyond tool. Pro Shot Cleaning Rod Kit. There’s a lot of cleaning tools that are packed in this mid-range, double coated cleaning kit. The content of the maintenance set includes the bronze bristle and brass core brushes, mop, cotton patches, and brass accessories. The slick coated rod is resistant to heat and chemicals while the lubricant silicone cloth offers seamless and quick cleaning. Pro Shot Cleaning Rod Kit. When it comes to heavy-duty cleaning, this maintenance kit offers a great deal. The competitively priced cleaning tool set is made from sturdy, industry-grade, double coated stainless. Thus, it ensures long-term use and efficiency. Other accessories in the ensemble include the brass core brushes and bronze bristle. All these are designed to withstand extensive rifle cleaning and maintenance systems for years. Otis AR Cleaning System. Most accolades for this cleaning set are for its affordable price. However, the Otis rifle cleaning kit is also a formidable and long-lasting set. The cleaning tools are made from bronze, mongoose, copper materials for flexible cleaning solutions. Real Avid Pro Pack Maintenance Kit. For such a costly cleaning kit, this brand makes sure you get to use your tools for a longer period of time. Thus, the durable materials include brass and the ballistic nylon for the compact case. All 3 AR 15 maintenance kits in our list are designed for efficient cleaning and maintenance. The cleaning sets are all compatible to .223 cal. and 5.56mm AR platform rifles. Each kit also has their unique designs and features to ensure rifle access for seamless, thorough cleaning. The Otis cleaning system even integrates a belt clip to its lightweight soft pack for easy use. Real Avid Pro Pack assembles a wide array of tools for quicker, more effective cleaning. Pro Shot offers micro polishing while ensuring maximum barrel protection. Get more helpful information and ideas about Real Avid maintenance kit and check out their online video review. Otis and Pro Shot ratings are also available online. We award Real Avid Pro Pack Maintenance Kit our top accolade for the best AR 15 cleaning kit. Although it’s a little bit pricier than other cleaning tool sets on the market, you are 100% sure that you will get a wide assortment of items in one complete package. Get more details and check out our reviews for other must-have accessories including compass watch, reloading scale, and iwb holster for xds.